Fifteen-year-old Jen Morgan is on her way to Wales to join her family for the Christmas holidays. Her father accepted a teaching position at Aberystwyth University and moved to nearby Borth with her younger siblings, Peter and Becky, while Jen stayed behind in New England with her aunt so she could continue attending the same high school. The Morgans are in mourning: Jen’s mother was killed in a car accident just before Christmas, and the one year anniversary of the accident is quickly approaching. When Jen arrives in Wales, she realises that her father’s intention to help the family heal through a change of surroundings isn’t really working out as planned. Jen’s brother in particular seems to be doing worse than ever – he’s determined to hate everything about Wales, and clings to the hope that Jen will convince their father to take them all home. But things begin to change one day, when Peter finds an old metal harp tuning key near the sea in Borth. The key provides an unexpected connection with Wales’ rich past – a connection that helps the Morgans make sense of the present. 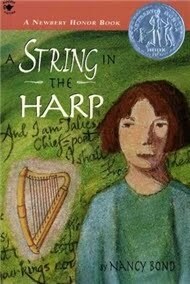 When I started reading A String in the Harp, I was immediately reminded of writers like Margaret Mahy and Diana Wynne Jones. These are writers I love for their ability to seamlessly combine fantastic or mythical elements with rich characterisation and everyday concerns, and this is an ability that Nancy Bond very much shares. I loved the family dynamics in A String in the Harp; I loved how sensitively and perceptively Bond captured the mourning process. Over the course of the novel, we watch the Morgans slowly transition from being isolated in their grief to acknowledging that they are all suffering, and that perhaps things will be a little bit easier if they reach out and let one another in. At the same time, I loved the novel’s atmosphere and expert use of history, setting, and legends. The plot of A String in the Harp is heavily based on Welsh mythology, particularly the legends surrounding the bard Taliesin and a sunken kingdom off the coast of Wales. Bond particularly highlights the connection between land and lore: the Welsh hills, the Bog and the sea are almost characters in their own right, and the stories Peter slowly discovers inject a place he initially thought of as empty and desolated with a richer life than he ever imagined it to have. 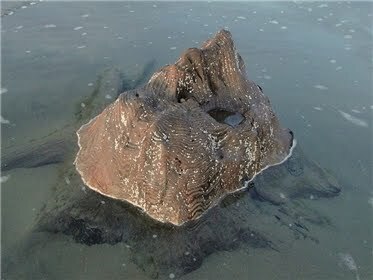 Petrified tree stump on the beach near Borth. Image from Wikimedia Commons. He also finds himself grasping with history; with the true meaning of living somewhere where human beings have lived and died and hoped and dreamed for thousands of years. As the past and the present are brought closer together, the Morgans discover a new sense of belonging: to the land, to the pattern of humanity, and most of all to each other, as they’re slowly released from the isolation of their pain. Jen could still feel the horror that had overcome her at seeing her father cry during that carol service. It has frozen her, made her unable to think or to move. She had not soon forgiven him for it because she couldn’t bring herself to reach out and say or do something that would comfort him. He should have been comforting her. All her life, Jen reflected now, she had truly believed that with age came wisdom; that when she finally grew up all the complexities she wrestled with would straighten themselves out for her and she would be able to deal with life confidently, with perfect assurance. She had only to wait. But it wasn’t so. Her father, who ought to know all the answers by this time, had just told her that he, too, was still groping. Oddly, Jen felt closer to him at this moment than she ever had before; he was as human as she and as much in need of reassurance and faith. Was he better at hiding him than she, or had she simply not noticed before? Jen (and to a lesser extent, Becky and Peter) goes from feeling betrayed because her father is also vulnerable to realising that of course he would be – he’s just as human as the rest of them are. Acknowledging that parents and other adults won’t always have solutions is an inevitable part of growing up, of course, and Nancy Bond deals with this process in a sensitive, thoughtful way that reminded me of Morris Gleitzman’s brilliant Two Weeks With the Queen: there’s no cynicism or bitterness here, just a lot of tenderness and an understanding of what was gained in addition to what was lost. A String in the Harp was first published in 1976, but it feels absolutely timeless – it’s that kind of book. It’s a novel full of atmosphere and subtle mythical elements that will appeal to fans of The Dark is Rising. Even the occasional jibes against those close-minded scientists with their silly reliance on facts (which I really could do without in my fantasy, thank you very much) didn’t bother me as much as they usually do – and that’s saying a lot. The gentle and insightful portrayal of a family in grief gives A String in the Harp universal appeal, and the lovely writing and rich, in-depth characterisation make it an absolute gem of a book. Becky kept telling Peter it would get easier for him, but it didn’t because Peter wouldn’t let it. He had to hang on to his hardness and hate or he couldn’t survive. Without the hate, there were only the intolerable homesickness and desperate longing for his mother. These hurt far too much to bear alone. After all, how long ago was hundreds of years? (…) Imagination couldn’t stretch that far, and yet vast pieces of time lay all around: in the sand underfoot, the shaping of the sea, the burnished hills, the Bog. They changed, but so gradually it was seldom noticed in a lifetime. They must all have been here fourteen hundred years ago. Suppose you could see other people’s footprints in the sand—not just the ones from this time that the tide hadn’t washed away, but the footprints every person had ever made on this beach… Peter thought his head would explode. This book sounds absolutely precious. I think it does take a little more than just family drama to make a story special, and the history seems to do that here. I'm going to see if my library has this! Wonderful review, Ana! The way the books weaves a beautiful story with history and mythology is very beautiful. I will add this book to my 'TBR' list. Does the book also talk about the music of the harp? I love the harp and the music that is produces and the way a harpist's hands moves coaxing the harp to part with its beautiful melodies. Sandy: Yes - otherwise you run the risk of crossing the line into melodramatic. But Bond is restrained in all the right ways. Vishy: Yes! They're a concert scene at one point. I should have mentioned that. I love that this book blends mythological elements with a very human story of hope and healing, and would love to read this one. It sounds excellent. I am so glad to hear that you really connected with it as well. I think Sandy hit on the right word with precious! On a side note, I really admire authors who can blend reality and fantasy in an authentic way. I really like the sound of this one. I enjoyed the Margaret Mahy one you recommended and I can see what you mean by blending reality with fantasy. This does sound good and true to life. I'll have to look for it. Sounds beautiful :) I see a point coming to you in the future for this one! Sounds like a beautiful read. Really like the quotes you've pulled out. Wow, this sounds *wonderful*. I especially like the comparisons to Wynne Jones, Mahy and The Dark is Rising... It sounds like a perfect read for me. As you may remember from my recent holiday, I'm a little in love with Wales. This book sounds delightful, will have to keep my eyes open for it. This is one of my favorite books--I'm so glad you liked it too! This sounds like a lovely book. I know if you loved it, I'll enjoy it. Great review. Oh, I've never heard of this but it sounds fantastic. Also, I've had The Dark is Rising sequence on my wish list forEVER and this reminds me that I must get going on that. Some day. I liked how the author portrayed the shockingly difficult transition from the US to Wales - I found the old house, with its draftiness, lack of central heating, and lack of modern amenities, almost a character of its own. I know that if I had been Peter, I would never have stopped complaining about the indoor cold! It's unusual in children's books, I think, to have the kids be so unhappy and sulky...but it worked so well. This went right on to my wish list! I so want to read it. Wales, music, and comparisons to Margaret Mahy and Diana Wynne Jones. Lovely!! Wonderful review, Ana. You do know that I expect one day to see a collection of your posts together in a book by you, don't you? You and Eva both. Zibilee: I really did. It will probably land a spot on my favourites of the year list. Trisha: Yes, me too. That's something my favourite fantasy authors all have in common. Vivienne: I think you'd enjoy this too! Kristin: Both you and Susan absolutely have to read this! It's definitely your kind of book. Jessica: In some ways the book is a tribute to Wales, so there will be plenty for you to appreciate here. Charlotte: I think it was you who first put it on my radar, so thank you! Vasilly: Thank you! I hope you do! Aarti: I really hope you enjoy The Dark is Rising. Susan Cooper is just brilliant at atmosphere. Mumsy: Yes! That was so well done. Characters like Peter are not usually sympathetic, but she made readers understand where he was coming from without ever softening how infuriating he could be to his family. Susan: Like I was telling Kristin, read this! It's a very you book. And aw, you're too kind. I try to keep my self-depreciating thoughts about my own writing to myself, but I want you to know I really appreciate how supportive and encouraging you always are.